One year ago, a British Sikh man on a wedding trip to India was abducted in the middle of a street in the city of Jalandhar, Punjab. Several men grabbed him, threw a sack over his head and bundled him into a van. It later transpired they were Indian police and had arrested Jagtar Singh Johal, who had just got married, in connection with a murder. One year later he is still waiting to be fully charged, let alone face trial. Johal's case has angered Sikhs across the world and prompted protests in his name as far away as Australia and Canada. This isn’t because he was particularly well-known before his arrest, but because many see him as another example of a Sikh being targeted by the Indian state for their political beliefs. He says he merely contributed to a website that highlighted human rights violations against Sikhs in India. He also denies all charges against him. Many Sikhs are also angry at the UK government for doing little to secure his release. That view is shared by Johal’s local MP Martin Docherty-Hughes. In an interview with Barfi Culture, one year on from his constituent’s arrest, he has lashed out at the British government for their "limited support" of Johal and his family. He also says the Indian judicial process has been undermined by its lack of transparency and prejudicial statements by politicians. 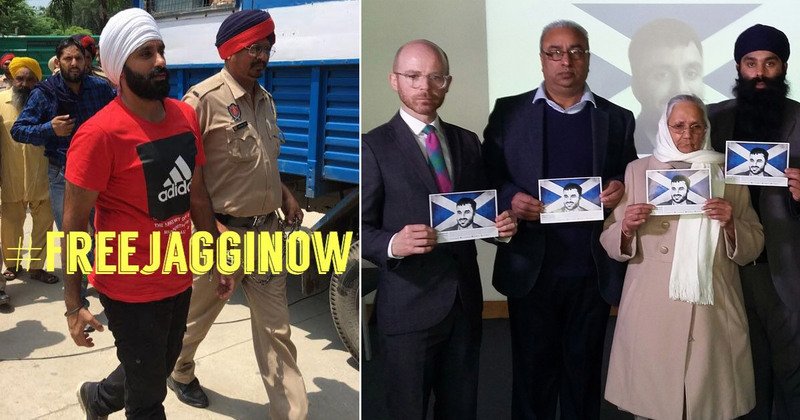 Martin Docherty-Hughes MP is still trying to get a meeting with the Foreign Secretary Jeremy Hunt to talk about Jagtar Singh Johal. Since his appointment, Hunt has spoken out on behalf of other British citizens imprisoned abroad but has said nothing about Johal. "I’m not demanding the UK govt should demand that Jagtar be set free," Docherty-Hughes tells Barfi Culture. "But what they’re doing is a lot less than what most countries would do for their citizen in this position." He says it's “extraordinary” that there is no legislation around what citizens can expect in support from the British consulate. People are doing what they can, he says, and it is very ad hoc. Jeremy Hunt’s office hasn’t even responded his letter asking for a meeting. Neither Boris Johnson nor Jeremy Hunt have met with Jagtar Singh's family. He says the UK should be loudly calling for an open and fair judicial process for Jagtar Johal, especially given the allegations of torture. He also says they should be calling for an independent medical examination but haven’t. In November 2017, then Foreign Office Minister Rory Stewart promised "extreme action" if it transpired Johal has been tortured. But neither has Johal been allowed private access to British consular officials to inform them nor has the British government demanded such access. Johal’s MP is equally annoyed by how his constituent has been treated in India. "It's not my position to tell the Republic of India how to run their legal system," he says. "All I ask for is openness, transparency and due process. But even that is seriously lacking." "If they are telling the world they are running a fair legal system, then they need to run a fair trial," he says. But how can that system be fair when the Chief Minister of Punjab has been repeatedly pronouncing him guilty in the local media, he asks. So far, Johal has been asked to attend a record-breaking 60 court hearings. Each time the case has simply been adjourned and Johal is taken back to his jail cell. The hearings are being held to give the impression a judicial process is underway. But it is going round in circles. "The trial by media of Jagtar Johal is undermining due process [in India]" Docherty-Hughes MP says. "My job, as his constituency MP, is to speak out and say that the system [in India] does not seem fit for purpose."